It is advisable to have sufficient storage space to run any device so is the case with your Android Smartphone. 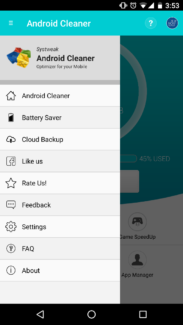 To boost up speed and performance of your Android device you can use Systweak Android Cleaner. This app helps you to clean your device’s RAM effortlessly, delete junk files and helps you to manage your apps in a better way. It works as a battery saver and can convert your phone device as a dedicated gaming platform. It also offers you Cloud backup services to store your important files. Let’s look at some features this app offers. 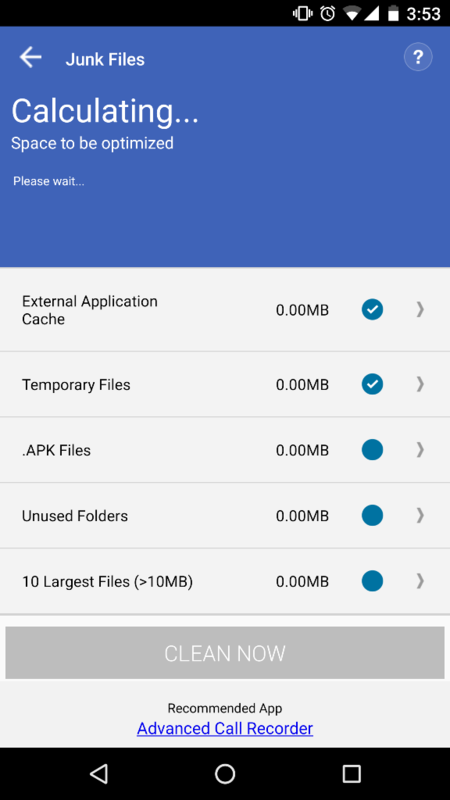 This section of app helps you to find and delete all junk files. 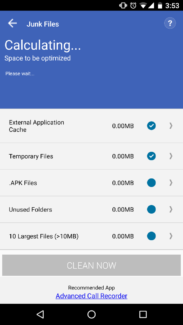 It helps you to scan complete data on your device and to categorize it according to different attributes like unused folders, temporary files, largest files, application caches and others. By clicking on ‘Clean now’ button you can remove all these junk files from your device to make some storage space instantly. 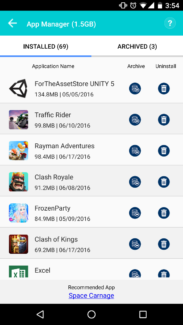 It can help you to turn your mobile device as a dedicated gaming platform by clearing RAM of your device. 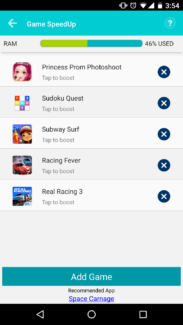 You need to enlist apps and games to the Game Speedup list first. Then it clears the RAM to offer you additional space to run your apps and games smoothly. 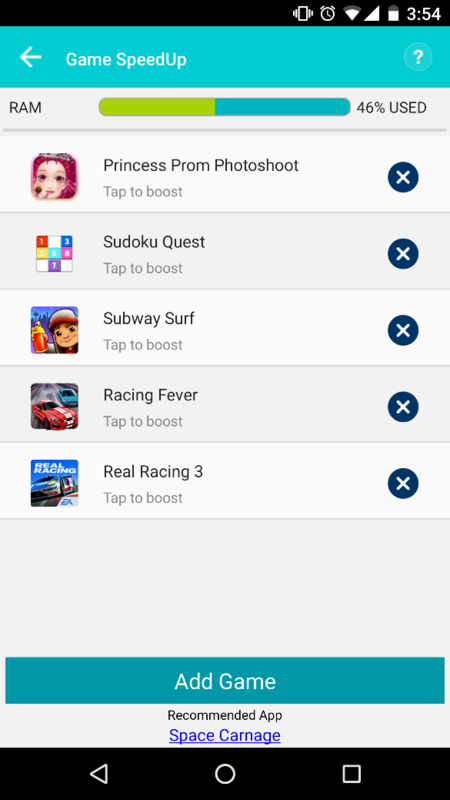 This app creates a widget on your device so that you can directly run the app or play game from the list. 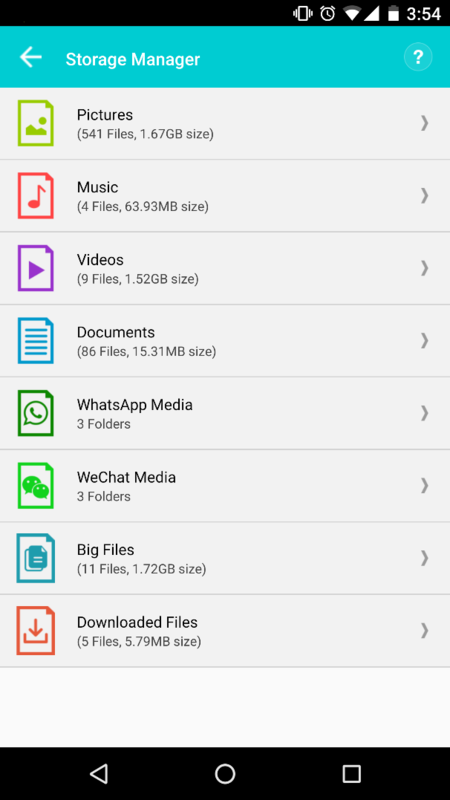 Storage Manager scans all files on your device and lists them according to their attributes like pictures, images, videos, documents etc. It also shows Big Files on your device so that you can manage them accordingly. You can delete the files by selecting the category or you can take the Backup of these files by clicking on Backup Now button. App Manager displays all the apps installed on your device and space occupied by them. 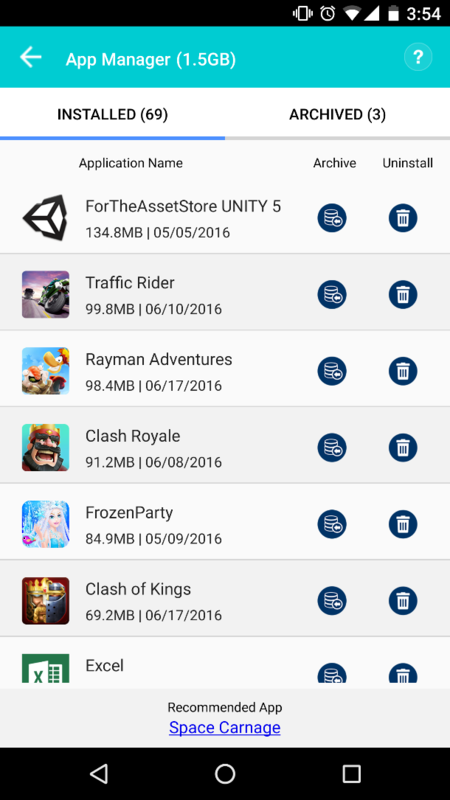 You can click on Uninstall button to make some storage space on your device or you can Archive these files as well. App stores only installation file of the archived app so that you can access that app in future. 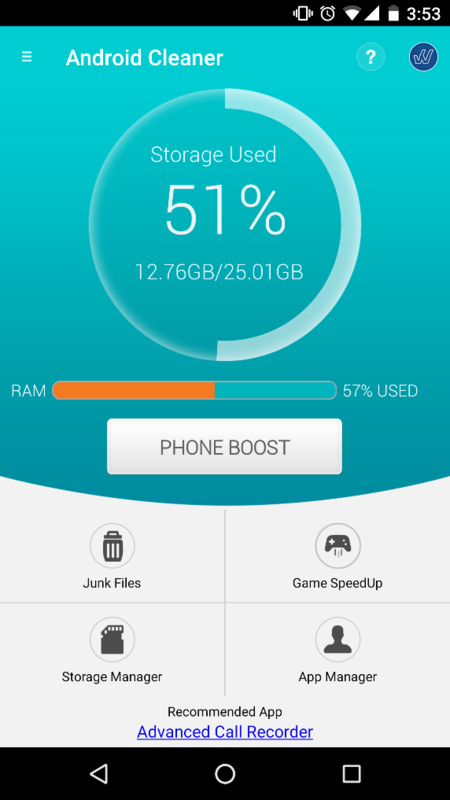 This feature of the app helps you to clear RAM of your device instantly to make space for some other important work. To clear RAM, it kills all unused and unnecessary programs running in the background. 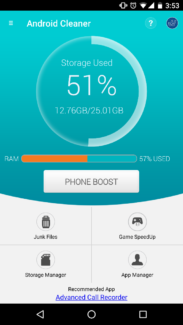 It also offers a widget called ‘1-Tap Optimizer’ to give you an access to faster RAM cleanup. This is an important add-on to your device. 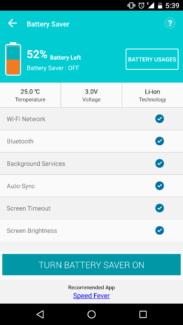 Using this feature you can extend your battery life to some extent. Once you click on TURN BATTERY SAVER ON, it immediately turns off all those services, which absorb your battery. 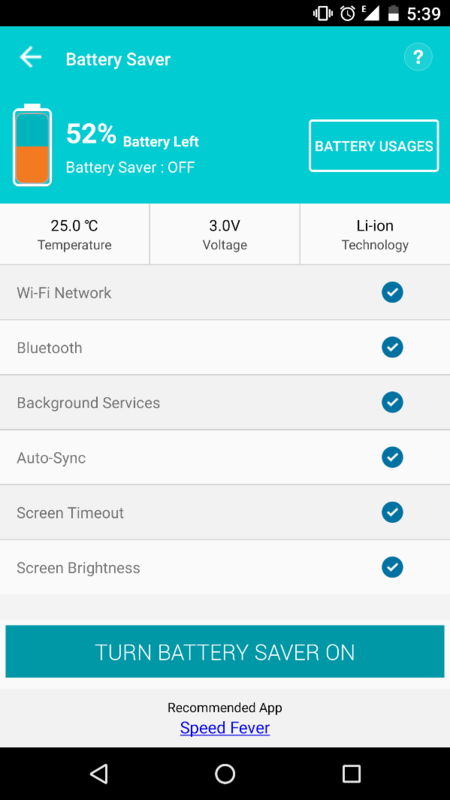 It displays a list of all the apps and programs according to their battery consumption in Battery Usages details. This app offers you to save your data in an instant and safe manner on the cloud. You can access and restore this data from cloud anytime you want. • You can turn on/off notifications related to this app anytime. • You can set Auto Cleaning time to clear your RAM on a regular interval. • You can put apps and programs in Ignore list to avert the scanning. • You can select the language of your choice. This app is very useful and user-friendly at the same time. It helps you to clear RAM instantly for better speed and performance of the device. It also offers you an insight of all the data on your device so that you can manage it well. Unique features like Game Speedup & Cloud Backup are very useful for the common users. It helps improve your device performance overall.